I'm a sucker for historical novels set in ancient Greece and Rome. When a friend handed me this worn, clearly read and re-read book and told me "It's one of my favorites," I was excited to see what she was so excited about. Let's just say that I'll be taking that friend's recommendations on books very seriously from now on! Mara is a quick read with a love story that packs a good little punch. The main character, Mara, a smart, beautiful slave sold into spy craft in the palace is a real firecracker, and her counterpart and love interest, Sheftu, is her equal on every level. 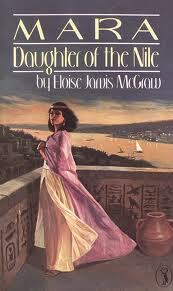 I loved the descriptions of life; in the palace, as a slave, in the streets of Egyptian cities under the rule of the Pharaohs. Lovely, fun read that will capture your attention and your heart.